CURVE’s visualization technology is helping researchers take a closer look at our origins. In an effort to understand “local climate dynamics relevant to the time periods and the regions where human evolutionary change took place” researchers are studying core samples taken from East Africa. (human origins drilling project) These core samples are part of the Smithsonian Institution’s Human Origins Program. 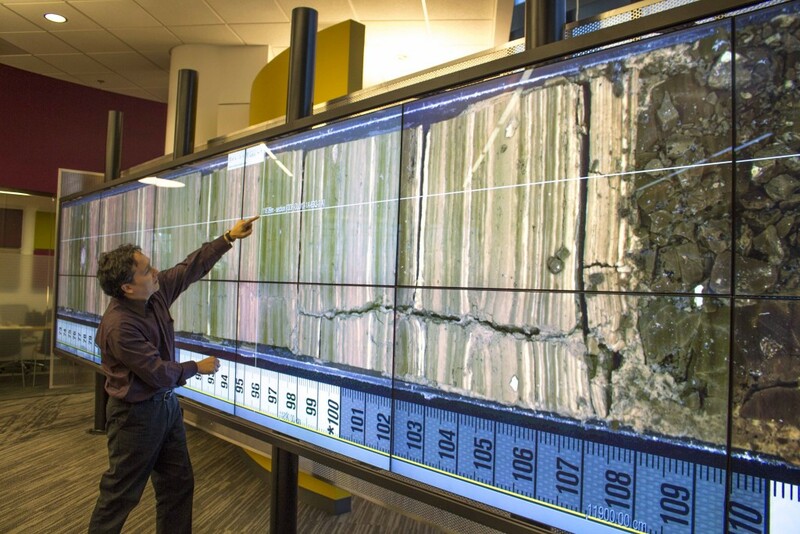 Dr. Dan Deocampo, Human Origins Program research team member and GSU Department of Geosciences Chair uses Corelyzer on the CURVE interactWall to analyze the Smithsonian’s Olorgesailie core sample from Kenya. Read the full post on the CURVE site. This entry was posted in Anthropology, Biology, Chemistry, Computer Science, Faculty Publications and Research, For Faculty, For Graduate Students, For Students, General News, Geosciences, History, Publications and Research, Software. Bookmark the permalink.